Responding to a question, Zuckerberg acknowledged that a lot of people probably just accept terms of service without taking the time to read through it. Facebook founder and CEO Mark Zuckerberg acknowledged this during a Congressional hearing, his second in two days, on issues related to data privacy and security in view of the Cambridge Analytica scandal. “Yes,” Zuckerberg replied when Congresswoman Dana Louise DeGette said since the revelations surrounding Cambridge Analytica, Facebook has not noticed a significant increase in users deactivating their accounts. “Yes, that’s correct,” he said when DeGette said since the revelations surrounding Cambridge Analytica, Facebook has also not noticed a decrease in user interaction on Facebook. Zuckerberg said as a result of the scandal, and the questions raised, Facebook is going to put, at the top of everyone’s app when they sign in, a tool that walks people through the settings and gives people the choices and asks them to make decisions on how they want their settings set. Everyone around the world deserves good privacy controls, he said. “We’ve had a lot of these controls in place for years. The GDPR (General Data Protection Regulation) requires us to do a few more things, and we’re going to extend that to the world, he told lawmakers. Introduced by the European Union, GDPR or General Data Protection Regulation requires that the company’s request for user consent in a clear and concise way, using language that is understandable, and be clearly distinguishable from other pieces of information, including terms and conditions. It is prescription on how companies treat consumer data. And it makes it clear that consumers need to be in control of their own data. “I think we may be updating it a little bit. But, as you say, we’ve had the ability to download your information for years now. And people have the ability to see everything that they have in Facebook, to take that out, delete their account and move their data anywhere that they want,” he said. “I view our responsibility not as just legally complying with laying it out and getting that consent, but actually trying to make sure that people understand what’s happening throughout the product,” he said. 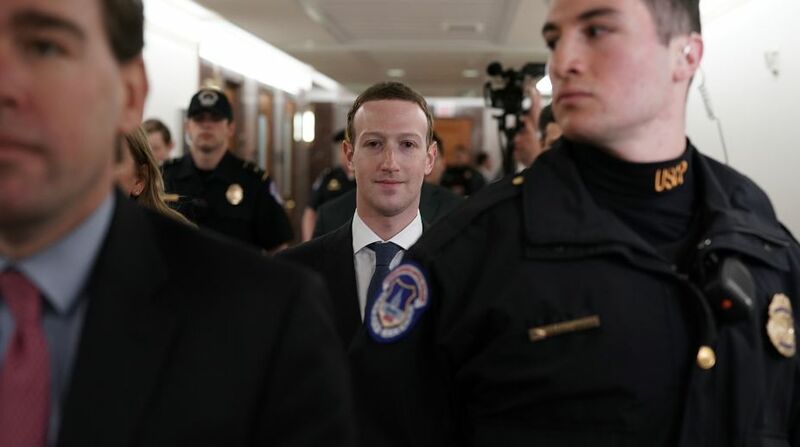 “That’s why, every single time that you share something on Facebook or one of our services, right there is a control in line, where you control who you want to share with, because I don’t just think that this is about a terms of service. It’s contextual,” he noted. “You want to present people with the information about what they might be doing and give them the relevant controls in line, at the time that they’re making those decisions, not just have it be in the background sometime, or make a one-time decision,” he said. Zuckerberg said Facebook has the ability to detect when a foreign entity is attempting to buy a political advertisement. “This is an extremely important area. After we were slow to identify the Russian information operations in 2016, this has become a top priority for our company to prevent that from ever happening again, especially this year, in 2018, which is such an important election year with the US mid-terms, but also major elections in India, Brazil, Mexico, Hungary, Pakistan and a number of other places,” he said. Facebook is working on a number of things, including deploying new Artificial Intelligence tools that can proactively catch fake accounts that Russia or others might create to spread misinformation. The social media company, he said, is not aware of any specific groups like that, that have engaged in the white supremacist rally in Charlottesville last year. “We are conducting a full investigation of any apps that had access to a large amount of data. And, if we find anything suspicious, we’ll tell everyone affected,” he said.